Don't miss the Tuesday, May 19, Café Scientifique presentation Feathered Ghosts: The Fish-Eating Owls of Northeast Asia. It's at the Bryant Lake Bowl in Minneapolis, at 7:00pm. 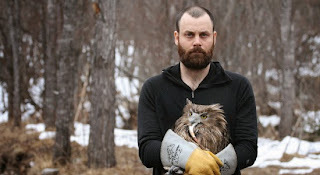 Dr. Jonathan Slaght, a conservation biologist for the Wildlife Conservation Society’s Russia Program, is a leading expert on one of the rarest raptors, the Blakiston’s fish owl. He will describe his research into the secret lives of the fish owl—massive, shy creatures that prey mostly on salmon. Slaght will also discuss how the divergent economies of Russia and Japan (where these birds are found) have influenced conservation efforts. Slaght received a Master’s Degree in Conservation Biology and a Ph.D. in Wildlife Conservation from the University of Minnesota, and is considered one of the world’s foremost experts on Blakiston’s fish owl; he likely knows more about this endangered species than anyone else in North America. He spent time in TRC's clinic, working to learn how to safely handle wild owls. Dr. Slaght has also started working with honey buzzards; read about one of his encounters here.